The hondo (temple hall) is where we gather to listen to the teaching of the Buddha-Dharma (the Buddha’s Teachings) provided by Buddhist ministers. The Midwest Buddhist Temple is a temple of the Jodo Shinshu school of Buddhism and Jodo Shinshu is a Japanese Buddhist practice. The iconic images in the hondo have traveled historical and spiritual journeys, sharing their significance within Jodo Shinshu. Looking within the hondo, it is easy to wonder about the significance of each item. 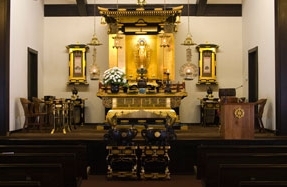 The religious hall is divided into two sections: the naijin (the inner altar area) and the gejin (the outer area of the hall where people sit during services). Our gejin is 80 percent of the hondo space and has a simple design compared to the naijin, which is highly decorated with iconic, symbolic features. Historically, a naijin would have been larger to accommodate a large number of monks and priests participating in services with a small space for only a few lay people observing. But a shift of practice occurred after Shinran Shonin, the founder of Jodo Shinshu, welcomed lay people to practice Buddhism and not just be observers. The size of the gejin needed to grow in size to accommodate the increasing numbers of lay followers. When you enter the hondo, you are immediately greeted by the vision of the shrine of Amida Buddha in the naijin and the smell of burning incense. Our naijin is unique, having a rather large statue in a relatively modestly sized room. This was a break from tradition made by the late Rev. Gyodo Kono, the founding minister of Midwest Buddhist Temple. He personally selected this statue of Amida Buddha; it was installed in 1972. Everything in the naijin is symbolic of the Buddha’s teachings and helps to express the tenets of Buddhist practices. When we face the naijin, we face Amida the Pure Land. Candlelight represents the Wisdom and Compassion of the Buddha, which illuminates the ignorance of human beings. Flowers signify impermanence, and they are a reminder of the fleeting existence of human life. Incense is traditionally associated with purification, and it also enhances religious feelings. Offering flowers and incense are traditional ways of praising the Buddha. This guide provides more foundational understandings of Jodo Shinshu by explaining the significance of the religious artifacts in our hondo. The gohonzon (central object of reverence) in MBT’s hondo is a statue showing Amida Buddha in a standing pose, right hand held up with the palm facing forward and the thumb and forefinger forming a circle. The left arm hangs downward, with the palm facing forward and the thumb and forefinger forming a circle. The circles represent our Oneness with Life. The statue is not an idol or god to be worshipped, rather it is a symbol of Enlightenment and ideals of truth of Infinite Wisdom. The statue shows Amida Buddha in human form, reminding us that humans can realize the truth. The Amida Buddha is leaning slightly forward—as if taking a step toward us with his right foot, bringing Infinite Wisdom and Compassion to all sentient beings. He is emerging from a lotus flower, representing the essence of the Buddha. The Buddha taught us to live like a lotus, which rises up through the mud (the human world) to produce a pure, beautiful white flower (the peace and beauty of Enlightenment). He taught us not to be defined by our environment and to grow out of all our afflictions and to rise above greed, hatred, anger and ignorance. There are 32 representations that signify a Buddha. These representations may vary with different Buddhas. 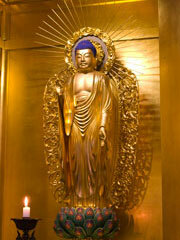 The standing Amida Buddha statue is similar to other Buddha statues through the use of some of the 32 representations. For example, the physical characteristics of his face share gentle facial expressions reflecting infinite wisdom, serenity, compassion and love. It has features descriptive of people from many races, serving as a reminder that the possibility of becoming a Buddha is not limited to one people, but is possible for all peoples. Another unifying characteristic is the jewel in the middle of the Buddha’s forehead. It originally represented a tuft of curly hair. Before Shakyamuni Buddha left his palace and his life as a prince, it is said he had long, curly hair. Shakyamuni cut his hair in a symbolic gesture to show that he was getting rid of his ignorance. Over time, however, this jewel in the Buddha’s forehead came to be commonly perceived as a symbol of the Amida’s third eye to see all—the “mind’s eye” that can see beyond this world into the realm of Enlightenment. 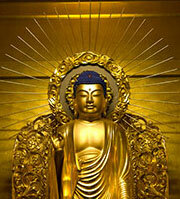 A nikkei, or small bump, on top of Amida Buddha’s head represents his vast wisdom. The Buddha’s eyes are half-opened/half-closed. Half-opened eyes symbolize that half of our vision is directed externally (concern for the outer world); half-closed eyes symbolize that half our vision is an internal self-reflection. Thus, Buddha’s half-opened/half-closed eyes symbolize the harmony of his outer and inner life. ensure Enlightenment to all sentient beings. 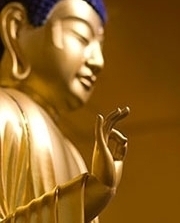 Different Buddha statues have various hand positions, called mudras. The standing Amida Buddha mudras have the index fingers and thumbs forming circles depicting Buddha’s law of no beginning and no end, while representing the complete harmony and perfection of Wisdom and Compassion. His right hand is held upward, bestowing fearlessness and inviting us to “come without fear.” It is a symbol of the Wisdom of Enlightenment. His left hand is held lower and parallel to the ground, representing Buddha’s dynamic compassion to save all beings. 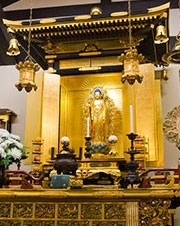 The gohonzon (statue of Amida Buddha) is standing inside the gokuden, a highly decorated structure. The gokuden sits upon the shumidan (see below). The way to end this dissatisfaction and suffering and to achieve Enlightenment is by following The Eightfold Path. Hanging from each corner of the gokuden is a sumi yoraku bell, historically, used as weather alerts. The shumidan, on which the gokuden sits, is a large rectangular throne made of wood lacquered ornamentally in red and black. The shumidan represents Semeru—the highest volcano in Java, or, according to the ancient Indian science of the origin and development of the universe, the highest mountain in the world. 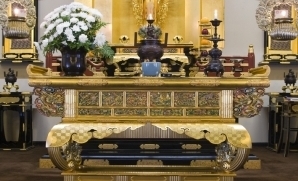 The uajoku is a small table that also sits on the shumidan in front of the gohonzon. Ritual offerings are placed on the uajoku in a planned arrangement of offerings called shigusoku. First is a kebyo (bulb-shaped flower vase used for offering water) with stems of greenery in the water. Next is a rosokutate (candlestick). Then a kasha (a double-tiered incense burner placed in front of the candlestick). And to the farthest right is a second kebyo. The kebyo are not placed on the altar as offerings of flowers, rather they symbolize the flowing of fresh water. Two buppanki (Buddha food vessels) sit on either side of the gokuden and are used for food offerings. Rice is the traditional offering since rice has been a staple food in Japan and an original offering. When a buppanki contains rice, it also looks like a lotus flower. Two danmori (four-tired circular stand) also sit on either side of the gokuden. They hold two or more fresh fruits and/or vegetables that are presented as offerings. Wakidan tables are two smaller “side altars” on either side of the shumidan. Above the wakidan on the right side of the Amida Buddha statue (facing the naijin) is a scroll of Shinran Shonin. A small gobunshobako box sits on the wakidan and contains the biography of Shinran Shonin. Above the wakidan on the left of the Amida Buddha statue (facing the naijin) is a scroll of Rennyo Shonin, the eighth descendant of Shinran Shonin. The gobunshobako box contains the letters of Rennyo Shonin. Two tsuri toro lamps hang in front of the gohonzon. Enclosed and hexagonal, they are modeled after ones Shakyamuni Buddha made for his disciples to use while traveling at night. He added the screens to the sides of the lamps so that, when traveling at night, insects attracted to the flames would not fly into the fire and be killed. Two kiko rinto, circular chrysanthemum lamps, hang in front of the shumidan on either side of the gohonzo. Their circle of light represents perfect Enlightenment with no beginning or end. The light shines Wisdom and Compassion in all directions of the universe. These lamps are modeled from the lamps Shakyamuni Buddha used. 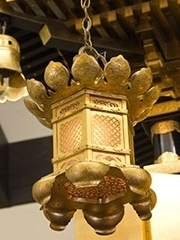 Kiko rinto lamps are used only in Jodo Shinshu temples. The daikin bell is on the right front side of the naijin (facing the naijin), behind the lectern near the sensei’s chair. 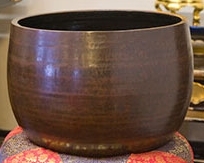 Designed to resemble Buddha’s begging bowl, the daikin also serves as a reminder to be humble. The sensei strikes the outside of the bell to announce that the service is about to begin and also during services when starting sutra chants, dividing the sutra into sections and to accentuate certain parts of the chant. 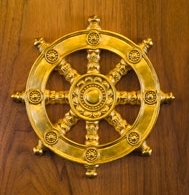 A Buddhist Wheel, the international symbol of Buddhism, appears on the front of the lectern. The eight spokes symbolize The Eightfold Path: Right Views, Right Thoughts, Right Speech, Right Action, Right Living, Right Effort, Right Mindfulness and Right Meditation. The equal length of each spoke represents justice, and the rim surrounding the spokes is a symbol of all-encompassing wisdom. The hub represents modesty and thoughtfulness, and the axle is the truth on which the wheel turns. On the right side, a candle. Flowers symbolize the impermanence of life and the changing existence of nature. The Buddha taught that all things in this world are impermanent and in constant change—that nothing is permanent. Like flowers, we are living now but, in time, will die. Flowers with thorns and strong odors are not offered. Burning incense teaches the transiency of ego and to become one with the Oneness of all life. 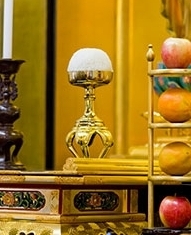 Burning incense also purifies the temple air, enhancing one’s temple experience. The burning candles represent the Infinite Light (Dharma) and Wisdom of the Buddha. The Dharma illuminates the darkness of ignorance and leads to a path to the Pure Land, shining on all with no discrimination. In Buddhism, wisdom is differentiated from knowledge. Knowledge is something acquired from external sources. Wisdom cannot be acquired externally and must be created within one’s own life, obtained through immediate and direct experiences. The light reminds us not to remain in darkness but to brighten ourselves through the Buddha’s teachings. White candles are used except for special services. Three misu (orange bamboo blinds) hang from the top of the naijin in front of the gejin. This style of blind was used originally in Japanese palace architecture to screen the sun and rain. Two large koro incense burners sit front and center where the gejin meets the naijin. They are used for incense offering (oshoko). Ornate dogs sit atop the lids and dragons on the sides of the koro symbolize protection of the Sangha. Oshoko, offering incense, is symbolic of praising the Buddha and is an expression of gratitude. It is also symbolic of a spiritual “cleansing” and burning away of life’s impurities. Offering incense is a preparation for listening to the Dharma and acts as a reminder to think kind and beautiful thoughts and to try and eliminate negative thoughts. 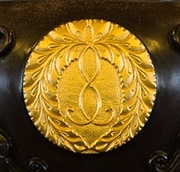 A Double Wisteria Crest, the official crest of the Hongwanji (the collective name of the largest school of Jodo Shinshu Buddhism), appears on the front of the koro. The crest consists of two panicles of wisteria flowers, connected at the top by intertwining vines and draping down to form a circle. Unlike other flowers that sit on the top of a stem, wisteria blossoms hang down from vines and, with this unique growth habit, symbolize humility and represent sincere reverence to Amida Buddha. In the front of the gejin, on either side of the naijin, two large framed kanji (Chinese characters) hang on the walls. The kanji on the left side says “Jump for Joy”—which was the theme of MBT’s 35th anniversary. The kanji on the right side says “Kenshin Kaishi,” the honorary title given to Shinran Shonin posthumously by the Japanese Emperor Meiji (1852-1912). The photographs on both of the side walls are of the monshu families (head of Hongwanji and direct descendants of Shinran Shonin).